There are lots of metrics within a myWindsock forecast. Here are some of the key metrics that will help you understand the weather conditions. Many of our propitiatory metrics are an attempt to quantify the conditions for cycling. An important point to understand is Air Speed. This is the speed of air flow when apparent wind speed and rider speed are taken into account. Click to view animation explaining Air Penalty. We take the Air Speed and the time exposed at this speed to produce a Air Distance. This is the distance you have travelled through air. We deduct the ground distance from the Air Distance to give an Air Penalty, the distance you have travelled through air further than along the ground. The distance of air calculate by Air Speed at time exposed. Tail winds will produce a lower Air Distance than Ground. A headwind will produce a greater Air Distance than Ground Distance. Given the Effective/Apparent Air Speed we calculate the time to complete the ground distance at this speed. Taking two riders with the same performance characteristics we run the myWindsock physics engine for the course with each. One with the forecast weather conditions, including wind and Rho (air density). The second with neutral weather conditions, zero wind, however with a fixed Rho of 1.2. We compare the two performances and calculate the necessary watts required to replicate the performance of the neutral weather rider by the rider with forecast weather conditions. 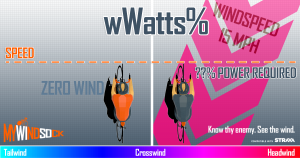 A percentage of the average overall watts required to overcome the weather conditions compared to a weather neutral rider.